Is anyone else hearing that blah-blah-blah about this Earth Hour protest tonight? We are supposed to turn off our lights for one hour, something like that. Ha, ha! I have a better idea. Well, Howard has it and I am repeating it. How about we turn off these people's idiocy for one hour? How about for one hour these zealots do not tell us what to do? Well, I am not going to carry on about this. I am in a great mood today. My mother and I are going to an estate sale. I will have to report back on what I find. My mom and I have gone to hundreds of estate sales over the years and I have also gone to a few with my friend Michelle from work. We have found serious treasures. The last estate sale I went to, I paid a quarter for a little booklet for Howard, called "Ted Kennedy: Wine, Women and WRONG." Where else would you find that? One of the best estate sales I ever went to was on Parkside Avenue. A couple of gay guys were moving to San Francisco. The stuff they were selling! The things I found! I got a set of black mixing bowls I still use. And the mirror that sits behind my piano. Observe lounge sensation Guy Boleri reflected in that mirror. You can sort of see it anyway. I also believe that fabled sale on Parkside was where I got my living room couch which, it is kind of beat up now, but it was nice back then. And I got this vase that sits on my hearth. The jazz singer Mark Murphy admired that vase, that is how pretty it is. He said if I ever wanted to get rid of it, he would take it. Wow, that is quality name dropping. Mark Murphy admired the vase that sits in front of my fireplace. That is a nice thing to be able to write! 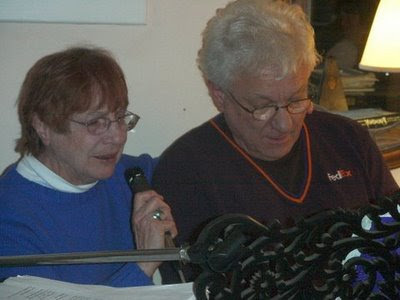 Here is a picture of Mark Murphy with our friend Ari Silverstein. Murphy is on the left. The best estate sale I was ever at was also one of the worst. I will give you the good news and the bad news of it. The good news was that the person who, um, died, or whatever, had been a piano fanatic. There was a huge bookshelf that took up a whole wall and was filled floor to ceiling with impeccably catalogued classical piano albums. It was like being in a library! You could just look for whatever you wanted and there it would be. It was like a dream. I went looking for Rachmaninoff playing his piano concertos because though I had the set already, I had lost the booklet that went with it and that had really been bugging me. I was afraid I had thrown the booklet out by mistake with my recycling. And I loved that booklet because it had wonderful pictures of Rachmaninoff. 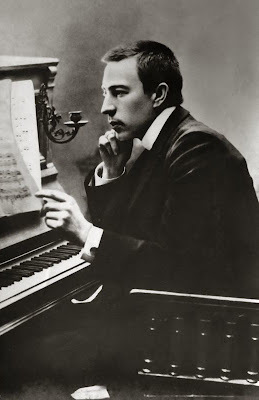 I do like looking at pictures of Rachmaninoff. So there that set was, and I bought it. I also bought a load of records by Rubinstein, Horowitz, Kapell, Brendel, etc. And when I got home I realized that the collector had even clipped reviews of these records, and saved concert programs, and had slipped them into the jackets. Incredible. So that is the good news of the situation. The bad news was, I went to that sale with my mother. She was following me around going, "Don't buy that. What are you doing with that? You have all those CDs. You have more music than you are ever going to listen to in your life. Put those records down." Etc. And I let her bug me into using moderation! In my dreams ... in my dreams ... I go back to that wonderful sale. I imagine all the treasures I could have bought. I bet there were tons of Leonard Pennario records there. Back then I had hardly heard of him, so I did not know enough to look for them. In my dreams, I find all those records. And I do not listen to my mother. Yeah, I do not listen to my mother. Right. Nevertheless, thanks for spreading the word! 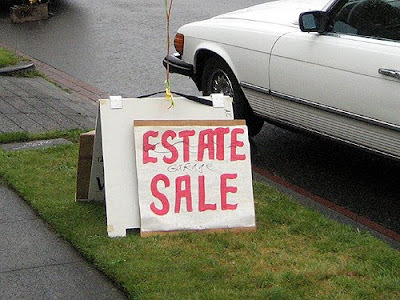 Well I have to say I don't recall that I have ever been to an Estate Sale before, but I know I WILL be going to the next one I see advertised now!!!! This was a very entertaing post Mary. I'm sorry, but Mark Murphy is my former biology lab partner at Clarence Central and the President of the Green Bay Packers. (Honest.) He's never been a jazz singer. We did try to convince him to pick up the jazz artist's recordings once in order to impress the ladies, but he didn't go for it.